Make the changes needed to turn your garden from a simple outside area to a bountiful paradise... build that shed you've been meaning to, level land in preparation for further work, or anything else connected with your garden - Allan's Gardeners is the garden design company which Londoners turn to when quality and precision are job requirements. With Allan's Gardeners, you'll never be in the dark about prices and rates - we hate hidden charges almost as much as you do! That's why we provide an in-person, on-site consultation with an expert garden designer, and give you a final price estimate. Garden Design Services in London - Why Use Us? Get great rate discounts when you use us for a regular garden maintenance or lawn care to maintain your beautiful new garden! How Do We Proceed With the Landscaping Services We Provide? Our Gardening services across London are executed professionally, with care for detail and flexible to every type of project we work on. 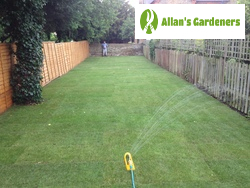 At Allan's Gardeners in London, we have worked on numerous gardening projects with thousands of customers across London, having installed new features and water features, lay patios, turf and astroturf, level land, build decking, construct sheds, and much more besides! 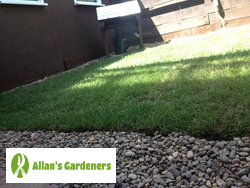 It's worth bearing in mind that every garden designer working for Allan's Gardeners has years of experience, not to mention training. So, if you're looking for advice with garden planning, you can always get up-to-the-minute pearls of wisdom from professional landscapers. What's more, we only use the most effective modern equipment on the market, so you're always getting the best with us. As briefly described above, all you need to do is give us a quick call to set up your appointment. From there, we'll take down all of the details about what you need done, and send over a London garden design specialists to take a look at your site. They'll be able to make some plans with you, and then send you a quotation within 3 working days for larger projects, or on the spot for some more basic tasks. After you've confirmed this price, we'll get started!